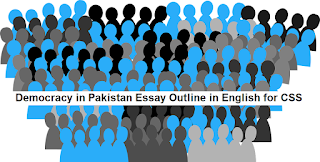 If you are looking for help to write an English Essay on Democracy in Pakistan for CSS or any other test exam then this is the page where you can find easy outline for Democracy in Pakistan Essay in English and write down your essay. Just read this outline in English and prepare for writing your essay on democracy in Pakistan with analysis of last 60 years in democracy in Pakistan. 1. Where does Pakistan stand in terms of democracy? 2. Is the democracy – an issue of Pakistan or all Muslim countries? 3. Is the democracy an issue of Pakistan or all third world countries? 5. Are the people of Pakistan non democratic? 6. Is the democracy solved the issues of Pakistan? 5. Election commission and procedure of election. 25. Will we ever be able to bring democracy? We are updating essay pages with more and more information for our student readers to help them study more easily. If you need more essay outlines or complete essays then comment below and share this essay outline with your fellow students.